Boston, MA — ZeroEnergy Design, an architecture and mechanical design firm, together with Silvia and Silvia Associates custom builders created an award winning modern, sustainable seaside home in Truro, Mass. It garnered three prestigious PRISM Awards last Wednesday, presented this year by the Builders Association of Greater Boston. 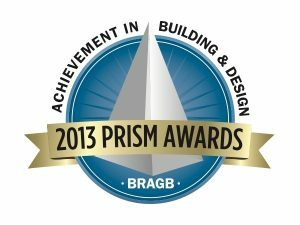 The PRISM Awards honor excellence in building, design, sales and marketing as well as many other categories. The contemporary beach house won gold for Most Innovative Single Family ‘Green Design,’ silver for Best Single Family Over 6,000 Square Feet and gold for Best Interior Design — Living Area. 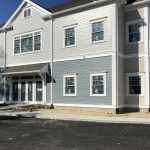 “We are extremely proud to win these awards, especially at a time that green building becomes more and more important,“ said Ron Silvia, president of Silvia and Silvia Associates. The modern oceanfront vacation home is environmentally sensitive, producing nearly as much energy as it uses in a year. The home features a geothermal heating and cooling system, radiant heating, a solar electric system, water conservation, native landscaping and fresh air ventilation to ensure healthy indoor air quality. The unique form of the home, inspired by the coastal topography, expands towards the water to capture the majestic ocean view. Designed for informal outdoor living, the home’s seamless ocean-side deck captures everyday summer living, while also offering a generous space to host family events. The interior furnishings offer colors that reflect the outside environment, including soft sandy browns and sunset reds. In addition to a modern sleek architecture style, the home has stunning floor-to-ceiling windows that offer breathtaking views of Cape Cod Bay. “Together, ZeroEnergy Design and Silvia & Silvia created an exceptional new residence, highlighted by these three PRISM awards, including two Gold and a Silver,” said Adam Prince, Business Development Principal at ZeroEnergy Design. Read more about the Cape Cod green home.